LOWELL – On Tuesday, March 19, Middlesex North Register of Deeds Richard P. Howe, Jr., joined Kids in Tech to teach students at the Moody School about the history of the City of Lowell, the role of the Register of Deeds, and the evolution of technology going back to the earliest days of the City’s founding. LOWELL – This Friday, in recognition of Pi Day (March 14), Kids in Tech will host a special Pizza “Pi” Party for students participating in the after-school tech program. As part of the lesson, students will measure the diameter and circumference of pizzas, and use this hands-on display as a lesson on fractions and ratios. LOWELL – In recognition of National Engineering Week, Kids in Tech students built their own robotic hands, created from everyday materials, as part of a lesson on future career opportunities in engineering and prosthesis. 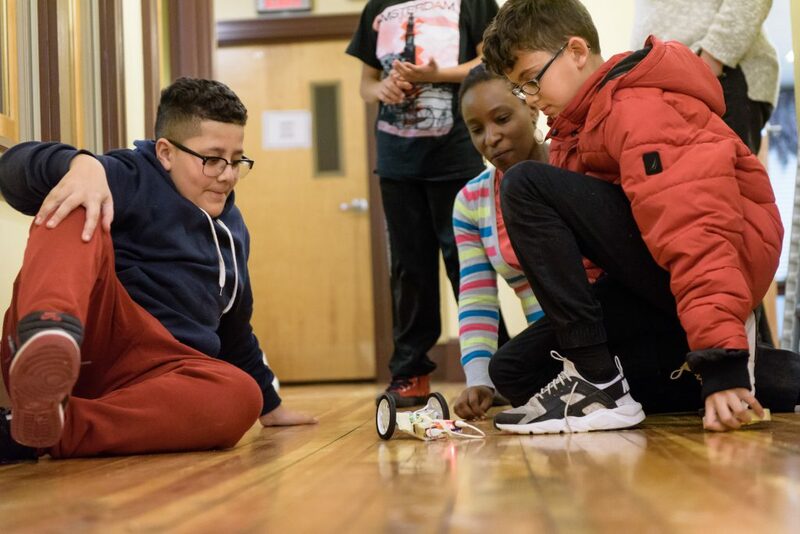 LOWELL – In recent weeks, Kids in Tech has hosted Tech Career Day at two program sites in Lowell: Moody Elementary School and Lowell Housing Authority. Featured speakers included Sam Devadoss and Eva Mascot, both software engineers from iRobot. The presentations came on the heels of a recent visit by Kids in Tech students to the ‘Cool Stuff’ museum at the iRobot headquarters in Bedford. At Moody Elementary School, students were able to explore the functionality of two different iRobot products: a Roomba® robot vacuum and a Braava® robot mop. Students had the opportunity to assemble these products, while learning about different types of engineering career paths in technology from Devadoss. At the Lowell Housing Authority site, students also engaged in an in-depth discussion about careers in software engineering within the robotics sector.